Long-lasting and cool. Toshiba's 15.6-inch laptop is powered by an AMD APU. The Satellite achieves good battery runtimes owing to its relatively low power requirement, operates quietly, and it barely heats up. 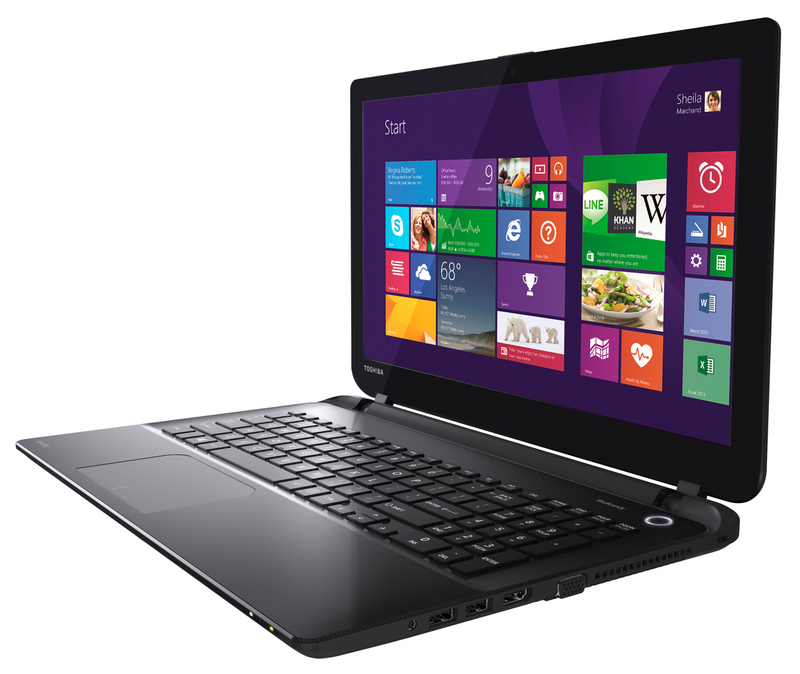 Toshiba adds another model to its lineup of affordable laptops with the Satellite L50D-B-127. The laptop is powered by an AMD APU from the Beema generation. 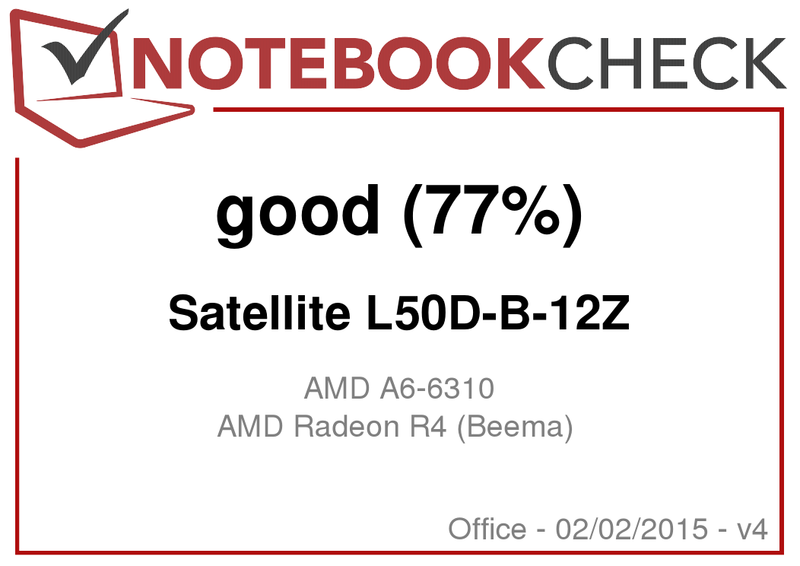 Regular Notebookcheck readers might recognize the Satellite since we have tested two higher-priced models from the Satellite L50-B line (Satellite L50-B-1TD, Satellite L50-B-182). Our report discloses whether the lower-priced Satellite L50D-B-12Z is compelling. Laptops with an equally low price, such as the Asus X555LD-XX283H, Lenovo IdeaPad Z50-75, HP 355 G2 or Acer Extensa 2510-34Z4, belong to the Satellite's contenders. Since the Satellite L50D-B and the two Satellite L50-B models that we tested feature identical builds, we will not go in-depth about casing, connectivity, input devices or speakers. Corresponding information can be found in the review of the Satellite L50-B-182. The Satellite L50D-B and Satellite L50-B are based on the same casing. However, different colors are used. While the models of the L50-B lineup are silver-gray, the casings of the L50D-B series are black. A printed pattern (dashed lines) additionally adorns the casings of both lines. The Satellite is equipped with a glare-type, 15.6-inch screen that has a native resolution of 1366x768 pixels. Unfortunately, the screen can only offer a low brightness. A rate of 183.4 cd/m² is no longer contemporary. We expect a minimum rate of well beyond 200 cd/m² even in the low-cost sector. Though neither the contrast (455:1) nor black level (0.4 cd/m²) are outstanding, they are still acceptable. The screen exhibits a clear color shift in state of delivery. The DeltaE 2000 rate is 12.5. A rate less than 3 would be the target. The screen also has a bluish cast. As expected from a laptop from the low-cost sector, Toshiba installs a TN screen in the Satellite. Consequently, the screen only has limited viewing angles. 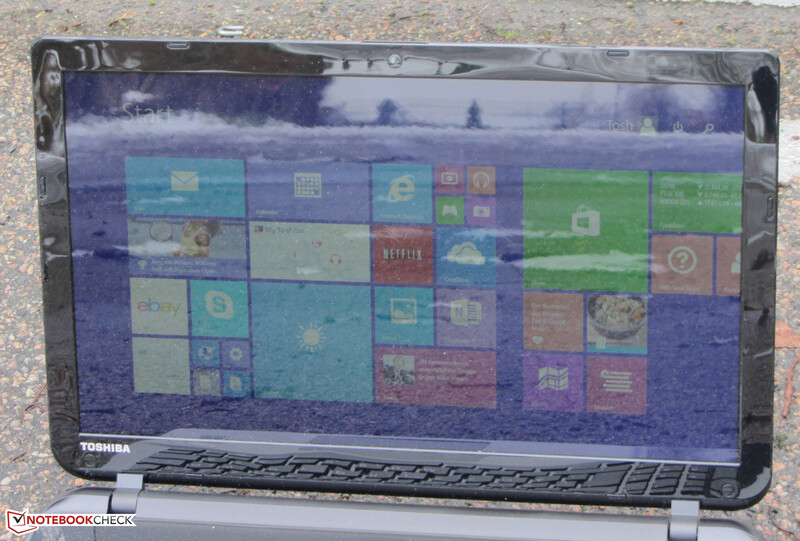 The laptop is not really suitable for outdoor use. The low brightness and reflective screen prevent that. 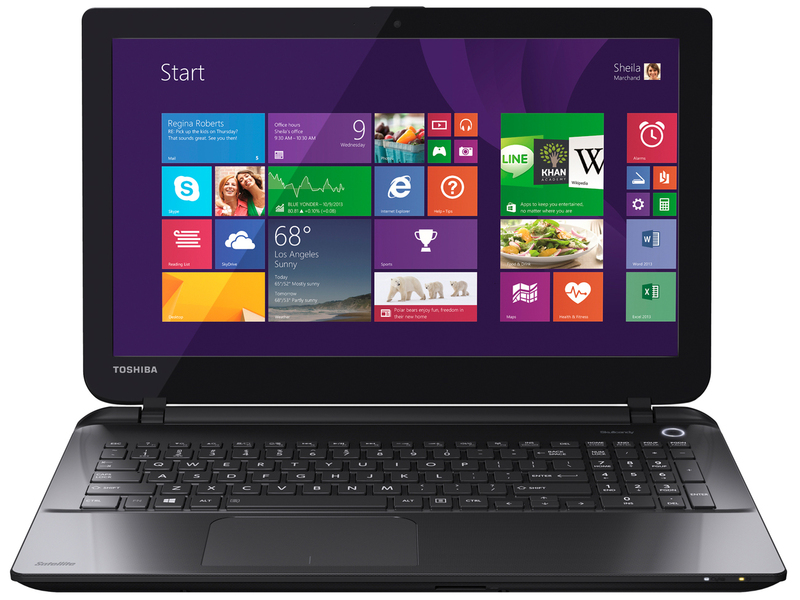 Toshiba's Satellite L50D-B-12Z is a basic, 15.6-inch office laptop. It has enough power for applications from the office and Internet fields, and for playing videos. Our review sample costs around 430 Euros (~$493). 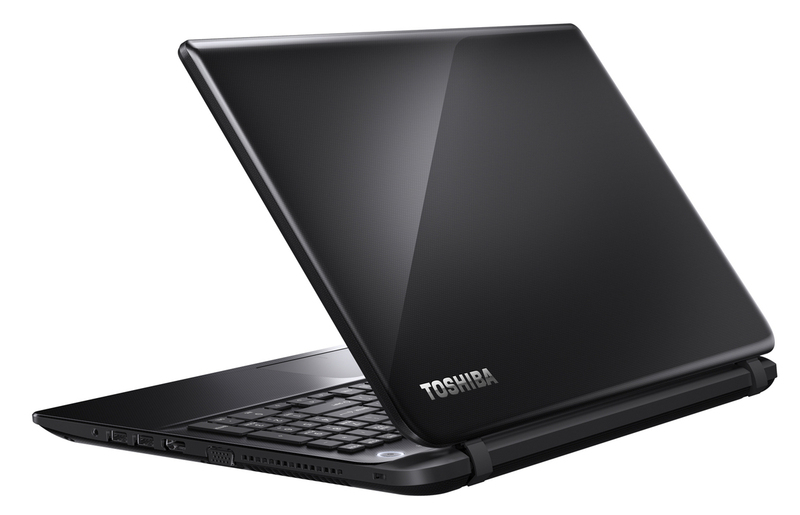 Toshiba has countless other configurations available. The Satellite sports an A6-6310 (Beema) APU from AMD. The APU includes a quad-core processor that clocks with a base speed of 1.8 GHz. Its speed can be boosted up to 2.4 GHz via Turbo. The Turbo is utilized in both AC and battery modes. The single-thread tests of the Cinebench benchmarks were processed with 2 to 2.4 GHz, and the processor ran the multi-thread tests with 2 GHz. The processor's multi-thread performance is roughly on par with Core i3 processors from the ULV Haswell generation. Intel's processor clearly has a lead in single-thread performance. The laptop did not cause any problems, and the system ran smoothly. 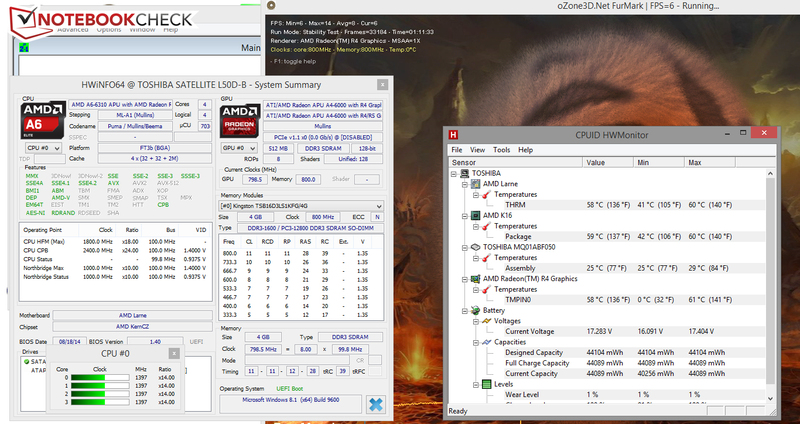 The PCMark benchmarks scores correspond to the installed APU's capabilities. 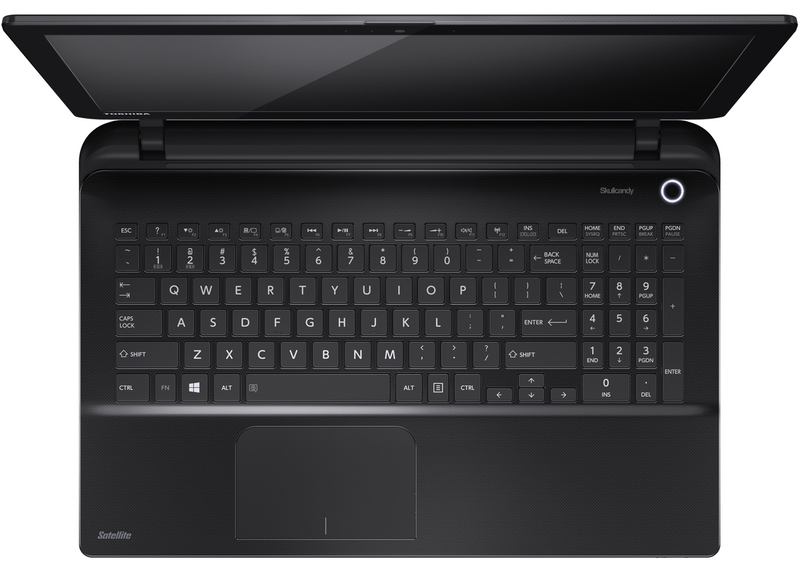 The Satellite's scores are just a bit lower than those of comparable Core i3 laptops, such as Acer's Extensa 2510-34Z4. Toshiba treats the laptop to a company own hard drive. It has a capacity of 500 GB and spins with 5400 revolutions per minute. The drive's transfer rates are good and correspond to the performance of modern 5400 rpm hard drives. The Radeon R4 (Beema) graphics core in the Satellite also comes from AMD. It supports DirectX 11.2 and clocks with speeds of up to 800 MHz. The 3DMark benchmark scores place the GPU somewhere between Intel's HD Graphics 4200 and HD Graphics 4400 graphics cores. Installing a second working memory will not result in a higher graphics performance in the Satellite. The incorporated memory controller only supports single-channel mode. The Satellite is not a laptop for gamers; it only manages to render some games smoothly in a low resolution and low quality settings. The lower the hardware requirements of a game are the sooner it can be played. Current smash hits like The Crew or Far Cry 4 are not among them, though. The fan is occasionally inactive in idle mode, and only the hard drive's noise is audible. The fan does not speed up excessively during load. We measured a noise level of 37.1 dB in the stress test, which is a very moderate rate. The Satellite processed the stress test (Prime95 and Furmark run for at least one hour) in AC and battery modes in the same manner. The processor clocked with a speed of 1.4 GHz, and the graphics core work speed fluctuated between 653 and 800 MHz. The temperature of Toshiba's laptop increases only moderately. The casing's temperatures remain below 40 °C even in the APU cooler area. (+) The maximum temperature on the upper side is 31.7 °C / 89 F, compared to the average of 33.9 °C / 93 F, ranging from 21.2 to 62.5 °C for the class Office. The Satellite is very restrained in idle mode. The power requirement is below 10 watts. The power consumption does not skyrocket during load, either. We measured a rate of 24.3 watts. The maximum power consumption will likely be approximately 30 watts if the processor and graphics core were not throttled. Websites are opened automatically every 40 seconds in the real-world Wi-Fi test. The energy-saving profile is enabled, and the screen's brightness is set to approximately 150 cd/m². The Satellite achieved a runtime of 5:45 hours - a good time. AMD's APU in Toshiba's Satellite L50D-B-12Z provides enough computing power for dealing with everyday requirements. At the same time, the laptop usually operates quietly and barely heats up. Beyond that, the input devices are compelling, and the buyer does not have to waive good battery runtimes. The low price level of around 430 Euros (~$493) takes its toll, though. Toshiba only installs a dark, viewing-angle dependent screen, and it only includes a one-year warranty. The low temperatures and decent battery life. Asus X555LD, Lenovo IdeaPad Z50-75, Acer Aspire E5-551G-F1EW, Lenovo IdeaPad G50-70, HP 355 G2, HP 350 G1, Acer Aspire E1-572G.